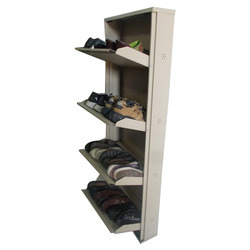 Our clients can avail from us a wide range of exclusively designed 4 Shelf Regular Shoe Rack which is skillfully crafted by our talented artisans. This shoe rack has an embossed design of mats that provides it a unique look. Besides, this door is known for the features like durable in nature, excellent finish, termite resistance and lasting shine.